Eurospa Eucalyptus Oil Uses: Stronger, Longer, Healthier Hair in 30 days? It’s Possible with These Natural Tricks! Stronger, Longer, Healthier Hair in 30 days? It’s Possible with These Natural Tricks! Having long hair, for many, is a sign of health, beauty and even elegance. Many people, both men and women alike, would love some surefire ways to have long and lustrous locks. Did you know that there's no fool-proof scientific method prove to accelerate or stimulate hair growth? This is a result of the many varying factors that contribute to the process, such as the weather, your age, what foods you eat, living habits and general overall health. With that being said though, there are still things you can do to hurry along hair growth and we are going to share with your our favorite beauty tips to do so! 1. Get your hair trimmed every month to every month and a half. You don’t need to take more than ¼ inch off; this is called “dusting”. It will clean the damaged ends off, allowing the shaft to continue growing out rather than in many damaged directions. 2. Biotin and B Vitamins. Your hair is made of minerals and proteins so it’s important to feed them with the food they need as it supports the keratin infrastructure of the hair. Make sure you only take the recommended dosage though, as overdoing it can reverse the progress. 3. Hair Masks. A lot of people believe that this tip concerning how to make your hair grow faster doesn't work well, but egg whites have been known for their healing properties and their ability to replenish hair and restore its softness and shine! 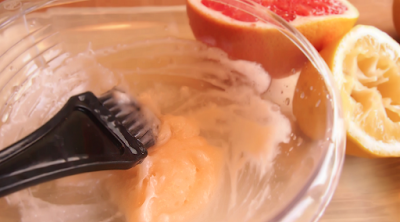 Just crack open a few eggs, strain out the yolks, and make an egg white mask for your hair. Your hair will look ten times healthier instantly and will feel a lot stronger as well -- which, ultimately, will allow your hair to grow faster! 4. Hydration. Drinking enough water each day helps the body to process and flush out toxins faster, which makes it a quick and easy natural method that will make your hair grow a lot faster. If you drink about 8 cups of water a day, not only will your body feel better, but your hair will get stronger. The stronger the hair, the faster that it grows. Drinking water also keeps your hair hydrated from the inside out. Hydrated hair is happy hair because, when dry, your hair is much more likely to break. 5. Never brush your hair when it’s wet. It’s more likely to break. Use a wide tooth come after applying a detangler and hair protection spray. 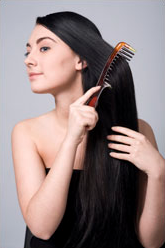 Brush each night to keep the hair smooth and tangle free; further avoiding breakage while sleeping. 6. Protect Your Tresses. It's old news, but heat is damaging to your hair! Try to stay away from blow dryers and heated tools, as they burn the hair. If you MUST use them, be sure to use a heat protecting spray or cream first, before styling. Keep in mind that the sun damages hair as well. In warmer weather, or intense sunlight (even in the snow) keep a hat on to protect your hair from over drying and burning. 7. Eat fats and protein. Did you know that what you eat actually makes a difference in how fast your hair grows? If you eat a lot of good fats and protein-rich foods, you will see a huge difference in the quality of your hair, as well as the speed with which it grows. Things like organic butter, coconut oil, avocado, flax oil, fish, eggs, fresh fruits and vegetables, and even different meats all make a difference, so cut down on junk food and focus on heal meals. 8. Use Eucalyptus. Of course, right? Get into a sauna, steam room or even your shower, one to two times a week and spray eucalyptus oil shower spray near your head, about arms length away; never onto the head directly. The circulation promoting plant oils will penetrate through your open pores, waking up the follicles. Add to this a gentle scalp massage and you'll have one happy head! You can also make a topical essential oil blend. I suggest mixing three drops of lavender oil, three drops of rosemary oil, and two drops each of thyme oil and cedarwood oil, along with some jojoba oil. All of this should go right onto your head and, I promise, the mixture will enhance your hair and make it grow that much faster!